Black History month may have been February, but several museums in Los Angeles are highlighting observations and images created by black artists in a series of new exhibitions this Spring. The Broad, Skirball Cultural Center and Los Angeles County Museum of Art (LACMA) typically highlight other artists and periods. However, the trio of museums, along with the California African American Museum (CAAM), have major exhibitions featuring works from black artists. “Soul of a Nation: Art in the Age of Black Power 1963-1983” at The Broad is a searing look at the civil rights and black power movements. Appearing at the downtown Los Angeles museum through Sep. 1, 2019, the exhibition also illuminates the inspirations and diverse perspectives of over 60 black artists, includes several with L.A. ties. Highlights include David Hammons’ “The Door (Admissions Office),” which consists of a glass-paned office door defaced by images of a black face and torso that slammed into it; Noah Purifoy’s assemblage pieces made out of debris from the Watts riots; Betye Saar’s stereotype-mocking “The Liberations of Aunt Jemima;” and Roy DeCarava’s mesmerizing photo of a “Mississippi Freedom Marcher.” Other artists include Romare Bearden, Melvin Edwards, Barkley Hendricks, Faith Ringgold, Alma Thomas, and William T. Williams. Charles White is also featured at The Broad, along with his retrospective at LACMA and the look at his influence at CAAM). Organized by the Tate Modern, the exhibit is making its only Western U.S. appearance, after previous venues in London; Bentonville, Ark. ; and Brooklyn. “Black Is Beautiful: The Photography of Kwame Brathwaite,” which opens April 11 at The Skirball, celebrates black beauty and the social changes that sprouted Afros and acceptance of diverse beauty standards. The Skirball exhibit will feature over 40 Brathwaite images from the 1950s and 1960s that illustrate how the photographer helped disrupt traditional norms and reshape cultural identity. The show will be at the Skirball, located alongside the 405 freeway on the West Side, until Sep. 1, 2019. It will then travel to San Francisco and South Carolina. “Plumb Line: Charles White and the Contemporary” at CAAM features works by White and contemporary artists influenced by him. The title refers to a “plumb line,” which is an architectural tool that is a featured element in White’s “Birmingham Totem,” which suggests that black artists can serve as architects of change. White saw himself as a plumb line, building opportunities for black artists. Located in the Exposition Park section of L.A. near the Coliseum, CAAM’s exhibit incor porates pieces from two dozen artists and will be on display until Aug. 25, 2019. “Charles White: A Retrospective” at LACMA includes about 100 drawings, prints and paintings by the 50+-year-career of the prolific White, who was also an L.A. civil rights activist. His early works focus on blacks in historical as well as contemporary settings. They are seen in ideal portraits or everyday scenes that extol their dignity in the face of injustices. With the escalating racial tensions in the 1960s, he stopped showing an idealized world and infused his work with allusions to poverty, educational inequities and other issues affected blacks. The exhibit will be at the midcity museum through June 9, 2019. Concurrently, they have a satellite exhibit, “Life Model: Charles White and His Students” until Sept. 14, 2019, in the gallery at the elementary school named for Charles White, located on the former Otis Art Institute site. 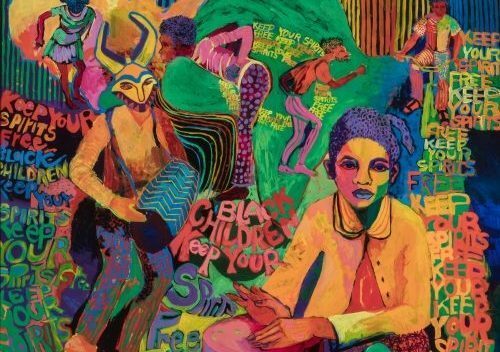 Photo top: Carolyn Lawrence’s “Black Children Keep Your Spirits Free, 1972.” Acrylic on canvas. 49 x 51 x 2 in. Image courtesy of the artist and The Broad. © Carolyn Mims Lawrence. 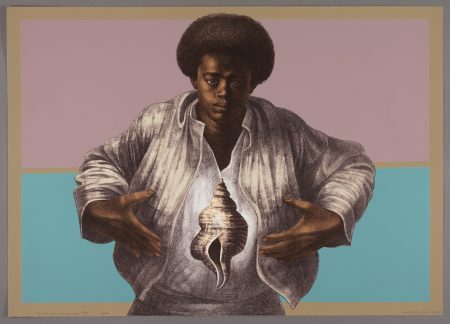 Photo insert: Charles White, “Sound of Silence, 1978,” color lithograph on white wove paper, 25 1/8 × 35 1/4 in., The Art Institute of Chicago, Margaret Fisher Fund, 2017.314, © The Charles White Archives, photo © The Art Institute of Chicago. Courtesy LACMA.